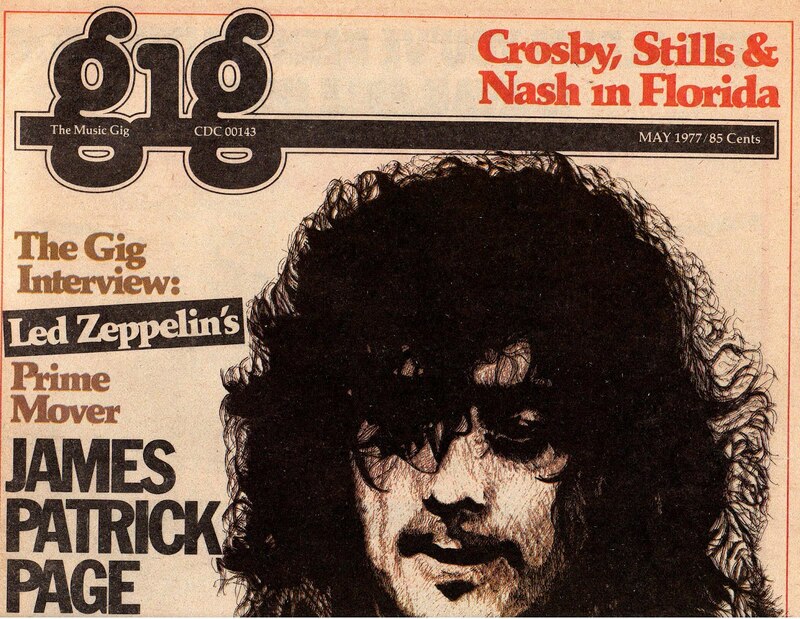 As the front cover suggests (Led Zeppelin, Crosby, Stills & Nash, Fleetwood Mac, and Tom Petty) this Volume 3 Number 9 edition of The Music Gig is from the 1970s. May, 1977 to be exact. It’s the only issue in my archives, and I have no recollection of whether I bought this magazine on a regular basis. The price was 85 cents. The Music Gig was published in New York by Editor in Chief Sam Chase, with Jean-Charles Costa serving as Editor. The format mimics Rolling Stone, with black & white printed pages except for an occasional dash of color. The back cover ad for Camel Filters is the only page in full color. Chris Salewicz’s interview with Jimmy Page is augmented by some distinctive illustrations by Charles Jackson Pate. Page reflects on rehearsals for a post Presence tour, the Led Zeppelin flick, The Song Remains The Same, and his confidence in the future of his band. Elsewhere, writer Steve Weitzman drops in on a Crosby, Stills & Nash recording session, and wonders if their first LP in years will put them back in the limelight. Susin Shapiro meets Tom Petty around the time of his debut release with The Heartbreakers and asks if that grin on the LP's front cover means he’s cynical. Teri Morris delves into the history of Fleetwood Mac and its tradition of incorporating new members into the group. There are also articles on Genesis and Peter Gabriel after the split, Thin Lizzy, Steve Hillage, Natalie Cole, and Leo Sayer. The Hollywood Hotline gossip page dishes on Keith Moon’s aborted wedding (he felt he was too young at 29); Todd Rundgren’s elaborate, 60-city tour; James Taylor working with producer Peter Asher on his first effort for Columbia; and an upcoming album from The Moody Blues. Most of the ads in the May, 1977 issue of The Music Gig were for albums, including new efforts from Tavares; Isaac Hayes & Dionne Warwick; Climax Blues Band; Weather Report; Andrew Gold; and The Amazing Rhythm Aces. In the charts, Rumours by Fleetwood Mac was the top album, and “Rich Girl” by Hall & Oates was the Number One single.